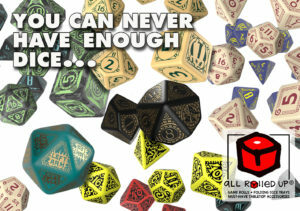 We’re always on the look out for new accessories to add to our range, and complement the all-in tabletop gaming package All Rolled Up looks to provide. Why settle for bringing any less than all your game to the table? We play a lot of games ourselves and find that we can get through a lot of sticky notes and index cards in any games, from Fate Core through Dragon Age , Dungeons and Dragons to Paranoia. Whether we’re writing up Aspects, noting Initiative, or passing secret notes – a lot of paper crosses the table. And, at the end of the night, that ends up in the recycle. Now, we have found an ideal alternative – the Wipeable PVC Card. You can write on these with dry wipe, wet wipe and permanent pens. And, we have found that our favour DryErase Bright Crayons also work perfectly well. If you use the permanent pens for permanent details, the dry wipes works for the transient stuff. Check out the 3-minute video I made and posted on YouTube if you want to see the sort of thing I’m talking about. We’ll be upfront – like battlemats and wipe boards, the PVC cards clean with variable efficiency. Like a well loved battlemat, you may find you get some staining. I have been testing a lot of pens and using these in my games for a little while – so, you can see from the picture, they’ve started to pick up some staining – but that doesn’t make them any less effective to write on again. We have found various cleaning options when you start seeing stains, or use permanent pens, but you’ll need to experiment. Sometimes L’Oreal Elnett hairspray will do the trick, while other times you’ll need to use Orange Stuff or Acetone-Free Nail Polish Remover (the best allrounder). The Berol Drywipe Pens we have in the Accessories section, alongside the Wipeable PVC Cards work well. They’re fine tipped, so you can write out things like traits and saving throws without struggling for space. Then, with a fatter tipped pen – like you might already use on your drywipe board or battlemat – you can scribble in bigger numbers. 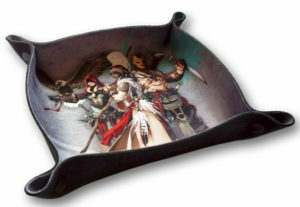 Finally, once you have your cards, you need something to store them in. We have a range of Card Boxes available in the Accessory section in a range of arresting colours. You can get Jumbo, Standard and Slim boxes, which hold a variable number of cards – whether playing cards, trading cards or Wipeable PVC Cards. The Slim box will hold 10 Wipeable cards, the Standard about 30, and the Jump around 50. Playing cards, being a bit thinner, will fit more. Wipeable PVC Cards. Sold in packs of 10 cards. White, blank, PVC; flexible, 760 microns thick. Can be used with dry wipe, wet wipe, and permanent pens – like Sharpies or CD writers. Refer to manufacturer instruction on use of wet and dry wipe pens. You can also use DryErase Bright Crayons. 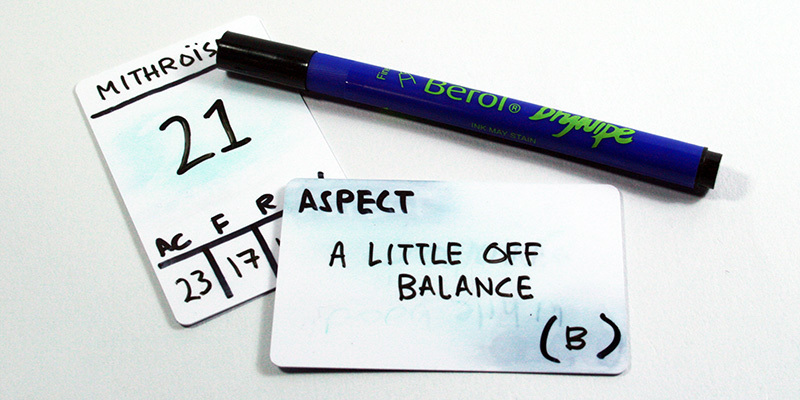 Cards may stain – exactly as pictured – with repeated use, especially with permanent pens. Card Boxes. Sold individually, or you can buy 6 for the price of 5. Various colours, as marked. Plastic #5 – Polypropylene (PP). Manufactured in the UK. Berol Fine Tip Drywipe. Fine line nib, 1.2mm width. Drywipe pen suitable for use on whiteboard or wipeable index cards. Tough nib, ventilated cap. Should be stored horizontally, replacing cap after use. Black ink. Ink can stain. Keep out of reach of children.